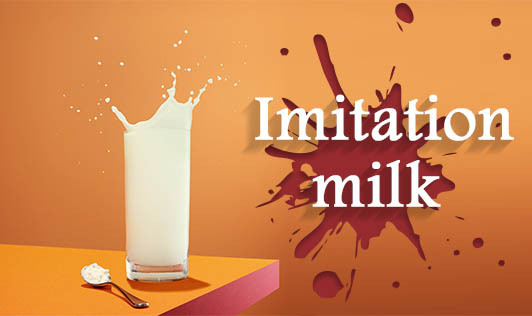 Imitation milk is a liquid compound designed to form a product much like milk in terms of properties, nutritional value as well as appearance. These usually involve compounds of milk drawn from ingredients such as rice, soya, hemp, coconut, and many more which as usually plant-based extracts. However, these are being substituted in place of milk in the manufacture of products such as yoghurt, ice cream, and cheese without lawful label indications. However similar these may seem, the FDA wishes to allow these products to grow and be sold in the market, but with labels mentioning that these are not of dairy origin if so. This is important as consumers may have personal preferences, health-associated requirements, allergies, or intolerance to specific food components, religious preferences, and several other reasons why they need to be informed as to where the milk they consume originates from. While imitation milk may lack hormones or quality, and may even cause certain allergies or tolerance issues depending on the individual, they also project advantages such as ease of manufacture, enhanced shelf life, better nutrient composition and an alternative similar to milk that vegans especially can opt for. Considering the fact that both, dairy and imitation milk have appreciable roles to play in a consumer’s diet, it is important to have them labeled and allow the consumer to make his/her choice. FDA needs to enforce these standards.